Space is a premium in most homes and garages so finding an effective way to store your bike(s) is really important for most households. Add to this that leaving your bike outside is not a great option if you want it to last a few years (the rust will build up real soon). Finding a simple bike rack for your garage wall shouldn’t be that difficult and thankfully these days there are plenty of options to choose from. StoreWALL gives you 2 easy to setup options which ensure your bikes are no longer lying on the floor or up against the car. We have 5 bikes in our household and they take up far too much room in the garage given the amount of use they receive. My kids love bike riding but getting them motivated to start the ride can be a challenge. Once its done they are quick to dump the bikes on the garage floor and run inside for a refreshment. It’s then up to me to set them all up again and get them out of the way. StoreWALL has two easy to setup options enabling you to either hang your bike vertically from the wall or to have it hang horizontally. Both options are safe and secure and the choice is determined by the amount of room you have. The first method utilises the StoreWALL J Hook (also known as the Bike Hook). 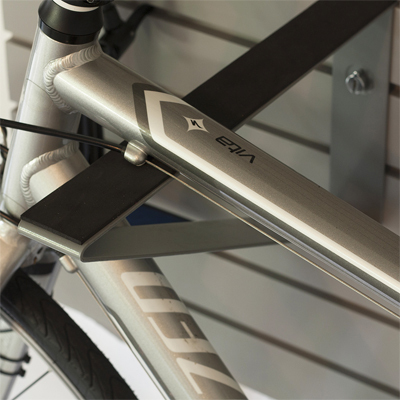 The StoreWALL Bike Hook needs to be added to your wall via the use of a slatwall panel. The slatwall panel needs to be placed at a height which allows the bike to stand on its back wheel. Ideally allow the bike to hang a foot or so off the floor. To lock the bike onto the hook all you need to do is place the rim or wheel inside the hook. Using the spokes to support your bike, it will be locked in. By hanging the bike vertically, you can actually hang several bikes in a very small area. The second method has the bike hanging horizontally. Combining a StoreWALL slatwall panel and two Heavy Duty 381mm Bike Brackets, the bike frame is placed over the brackets so that it is held in position. An effective way of positioning the brackets is to place them one slat groove apart. The bracket on the left can be the higher of the two. On each bracket add some anti-slip padding so that the brackets don’t scratch the frame of the bike. Coming 381mm off the wall, there is plenty of room for the bike frame to be rested on the brackets. The advantage of this option is that the bikes only hang a maximum 381mm off the wall (the size of the brackets). This will allow you to fit several bikes (smaller bikes sitting higher) and allows plenty of room for the actual vehicle. 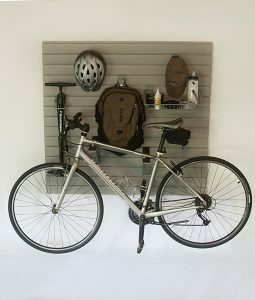 The added advantage of slatwall panels is that the panelled wall can also be used to store other items which are bike related. This includes tyre pumps, spare tyres, sporting clothes and helmets. Even if you don’t have a huge amount of room our smaller 1.2m panel can do an effective job for you. See our bundle below as an example. 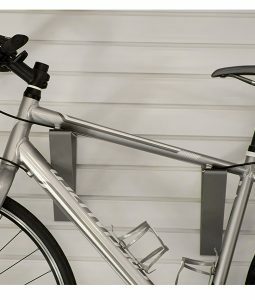 To get you started with a simple bike rack for your garage wall we have prepared two combination StoreWALL packages that incorporate either bike hanging method mentioned above plus much more. Note this is not just a one bike solution, it will cover pretty much everything you need related to bike . Total cost of the bundle is around $300 depending on the hanging options you select. Installed Dimensions: 1143mm in height and 1219 in width.